The Butcher's Daughter is a thought-provoking novel written as a memoir by the eponymous character, Agnes Peppin, the daughter of a butcher from Bruton in Somerset. Agnes falls pregnant by a local lad and is not allowed to keep the baby. She is then shuffled off to a convent care of her mother's heretofore unacknowledged family connections. Sent to Shaftsbury, Agnes has to find her way among the nuns and discern friend from foe. When the traumatic events of the dissolution of the monasteries overtake the community, Agnes has to find herself again. This is not a sentimental, comfortable read. It is stark and ruthless. To start with it is written in a first person narrative that flits between the past, present, and at times, future. The tunnel vision of the narrator, a well-educated girl for her time but in the great scheme of things, ignorant of much, can be frustrating and the narrative flow can be deliberately choppy which challenges the reader. Then there is the subject matter - a young nun who is witness to an act of unforgivable vandalism on an epic scale. The language used, religious houses 'surrendering', is that of war, and it becomes apparent that what Henry VIII did was not merely break with Rome but wage war on the Catholic church and his own people through no fault or blame of theirs. The innocent victims were not some bloated, wealthy abbots and bishops, but the ordinary nuns, like Agnes and her sisters, who were left homeless, unprotected and with no way to earn a living. Anyone who is a fan of Henry VIII’s policies after reading this is a bit weird. This is a compelling volume that packs a might punch. Literary rather than chic-lit, it is not an easy read, but it is worth it. 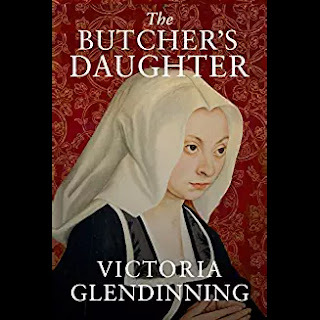 Ms Glendinning's research is exhaustive, her description of life in a Tudor convent is detailed and blunt, her portrayal of Agnes, brutal and honest. You have to like her, her lack of sentimentality in recounting events of deep emotion are heartbreaking in themselves, and you have to admire her tenacity and bullishness. A fine novel. I often see a lot of books I want to read, and this one is no exception. However, _The Butcher's Daughter_ I wish to read ASAP. Very compelling review and looking forward to release date!